This article gives you an overview of programming with ASP.NET Web Pages using the Razor syntax and Visual Basic. ASP.NET is Microsoft's technology for running dynamic web pages on web servers. The top 8 programming tips for getting started with programming ASP.NET Web Pages using Razor syntax. Basic programming concepts you'll need. What ASP.NET server code and the Razor syntax is all about. Most examples of using ASP.NET Web Pages with Razor syntax use C#. But the Razor syntax also supports Visual Basic. To program an ASP.NET web page in Visual Basic, you create a web page with a .vbhtml filename extension, and then add Visual Basic code. This article gives you an overview of working with the Visual Basic language and syntax to create ASP.NET Webpages. The default website templates for Microsoft WebMatrix (Bakery, Photo Gallery, and Starter Site, etc.) are available in C# and Visual Basic versions. You can install the Visual Basic templates by as NuGet packages. Website templates are installed in the root folder of your site in a folder named Microsoft Templates. This section lists a few tips that you absolutely need to know as you start writing ASP.NET server code using the Razor syntax. When you display content in a page using the @ character, as in the preceding examples, ASP.NET HTML-encodes the output. This replaces reserved HTML characters (such as < and > and &) with codes that enable the characters to be displayed as characters in a web page instead of being interpreted as HTML tags or entities. Without HTML encoding, the output from your server code might not display correctly, and could expose a page to security risks. If your goal is to output HTML markup that renders tags as markup (for example <p></p> for a paragraph or <em></em> to emphasize text), see the section Combining Text, Markup, and Code in Code Blocks later in this article. You can read more about HTML encoding in Working with HTML Forms in ASP.NET Web Pages Sites. A code block includes one or more code statements and is enclosed with the keywords Code and End Code. Place the opening Code keyword immediately after the @ character — there can't be whitespace between them. Dim weatherMessage = "Hello, it is " & outsideTemp & " degrees." You can store values in a variable, including strings, numbers, and dates, etc. You create a new variable using the Dim keyword. You can insert variable values directly in a page using @. Dim welcomeMessage = "Welcome, new members!" Dim myString = "This is a string literal"
To embed double quotation marks within a string value, insert two double quotation mark characters. If you want the double quotation character to appear once in the page output, enter it as "" within the quoted string, and if you want it to appear twice, enter it as """" within the quoted string. Dim myQuote = "The person said: ""Hello, today is Monday.""" The Visual Basic language is not case sensitive. Programming keywords (like Dim, If, and True) and variable names (like myString, or subTotal) can be written in any case. The following lines of code assign a value to the variable lastname using a lowercase name, and then output the variable value to the page using an uppercase name.
' Keywords like dim are also not case sensitive. An object represents a thing that you can program with — a page, a text box, a file, an image, a web request, an email message, a customer record (database row), etc. Objects have properties that describe their characteristics — a text box object has a Text property, a request object has a Url property, an email message has a From property, and a customer object has a FirstName property. Objects also have methods that are the "verbs" they can perform. Examples include a file object's Save method, an image object's Rotate method, and an email object's Send method. A key feature of dynamic web pages is that you can determine what to do based on conditions. The most common way to do this is with the If statement (and optional Else statement). result = "This page was posted using the Submit button." result = "This was the first request for this page." The statement If IsPost is a shorthand way of writing If IsPost = True. Along with If statements, there are a variety of ways to test conditions, repeat blocks of code, and so on, which are described later in this article. The protocol used for web pages (HTTP) supports a very limited number of methods ("verbs") that are used to make requests to the server. The two most common ones are GET, which is used to read a page, and POST, which is used to submit a page. In general, the first time a user requests a page, the page is requested using GET. If the user fills in a form and then clicks Submit, the browser makes a POST request to the server. In web programming, it's often useful to know whether a page is being requested as a GET or as a POST so that you know how to process the page. In ASP.NET Web Pages, you can use the IsPost property to see whether a request is a GET or a POST. If the request is a POST, the IsPost property will return true, and you can do things like read the values of text boxes on a form. Many examples you'll see show you how to process the page differently depending on the value of IsPost. This procedure shows you how to create a page that illustrates basic programming techniques. 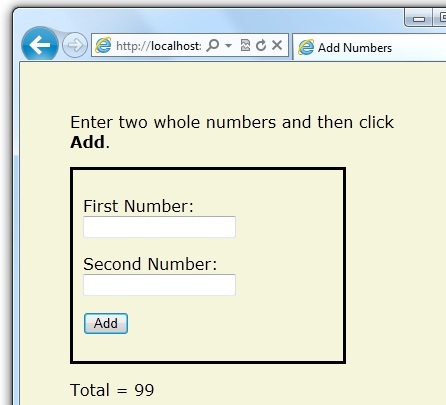 In the example, you create a page that lets users enter two numbers, then it adds them and displays the result. In your editor, create a new file and name it AddNumbers.vbhtml. Copy the following code and markup into the page, replacing anything already in the page.
' Retrieve the numbers that the user entered.
' Convert the entered strings into integers numbers and add. The @ character starts the first block of code in the page, and it precedes the totalMessage variable embedded near the bottom. The block at the top of the page is enclosed in Code...End Code. The variables total, num1, num2, and totalMessage store several numbers and a string. The literal string value assigned to the totalMessage variable is in double quotation marks. Because Visual Basic code is not case sensitive, when the totalMessage variable is used near the bottom of the page, its name only needs to match the spelling of the variable declaration at the top of the page. The casing doesn't matter. The expression num1.AsInt() + num2.AsInt() shows how to work with objects and methods. The AsInt method on each variable converts the string entered by a user to a whole number (an integer) that can be added. The <form> tag includes a method="post" attribute. This specifies that when the user clicks Add, the page will be sent to the server using the HTTP POST method. When the page is submitted, the code If IsPost evaluates to true and the conditional code runs, displaying the result of adding the numbers. Save the page and run it in a browser. (Make sure the page is selected in the Files workspace before you run it.) Enter two whole numbers and then click the Add button. 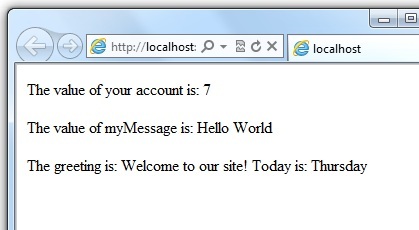 Earlier you saw a basic example of how to create an ASP.NET web page, and how you can add server code to HTML markup. Here you'll learn the basics of using Visual Basic to write ASP.NET server code using the Razor syntax — that is, the programming language rules. In server code blocks, you'll often want to output text and markup to the page. If a server code block contains text that's not code and that instead should be rendered as is, ASP.NET needs to be able to distinguish that text from code. There are several ways to do this.
' This line has all content between matched <p> tags.
' All content between matched tags, followed by server code. The HTML element can include text, additional HTML elements, and server-code expressions. When ASP.NET sees the opening HTML tag (for example, <p>), it renders everything the element and its content as is to the browser (and resolves the server-code expressions). Use the @: operator or the <text> element. The @: outputs a single line of content containing plain text or unmatched HTML tags; the <text> element encloses multiple lines to output. These options are useful when you don't want to render an HTML element as part of the output.
' Plain text followed by an unmatched HTML tag and server code.
' Server code and then plain text, matched tags, and more text. @DateTime.Now @:is the <em>current</em> time. The following example repeats the previous example but uses a single pair of <text> tags to enclose the text to render. @DateTime.Now is the <em>current</em> time. In the following example, the <text> and </text> tags enclose three lines, all of which have some uncontained text and unmatched HTML tags (<br />), along with server code and matched HTML tags. Again, you could also precede each line individually with the @: operator; either way works. To combine a long string that wraps to multiple lines like the above code, you would need to use the concatenation operator (&), which you'll see later in this article. Comments let you leave notes for yourself or others. Razor syntax comments are prefixed with @* and end with *@. This is a multiline code comment. It can continue for any number of lines. Within code blocks you can use the Razor syntax comments, or you can use ordinary Visual Basic comment character, which is a single quote (') prefixed to each line.
' You can make comments in blocks by just using ' before each line.
' There is no multi-line comment character in Visual Basic.
' You use a ' before each line you want to comment. A variable is a named object that you use to store data. You can name variables anything, but the name must begin with an alphabetic character and it cannot contain whitespace or reserved characters. In Visual Basic, as you saw earlier, the case of the letters in a variable name doesn't matter. A variable can have a specific data type, which indicates what kind of data is stored in the variable. You can have string variables that store string values (like "Hello world"), integer variables that store whole-number values (like 3 or 79), and date variables that store date values in a variety of formats (like 4/12/2012 or March 2009). And there are many other data types you can use. To declare a variable without specifying a type, use Dim plus the variable name (for instance, Dim myVar). To declare a variable with a type, use Dim plus the variable name, followed by As and then the type name (for instance, Dim myVar As String).
' Assigning a string to a variable.
' Assigning a number to a variable.
' Assigning an expression to a variable.
' Assigning a date value to a variable.
' Assigning the current page's URL to a variable.
' Declaring variables using explicit data types. Dim name as String = "Joe"
The following example shows some inline expressions that use the variables in a web page.
' Embedding the value of a variable into HTML markup.
' Precede the markup with @ because we are in a code block. Although ASP.NET can usually determine a data type automatically, sometimes it can't. Therefore, you might need to help ASP.NET out by performing an explicit conversion. Even if you don't have to convert types, sometimes it's helpful to test to see what type of data you might be working with. The most common case is that you have to convert a string to another type, such as to an integer or date. The following example shows a typical case where you must convert a string to a number. Cannot implicitly convert type 'string' to 'int'. To convert the values to integers, you call the AsInt method. If the conversion is successful, you can then add the numbers. The following table lists some common conversion and test methods for variables. Converts a string that represents a whole number (like "593") to an integer. Converts a string like "true" or "false" to a Boolean type. Converts a string that has a decimal value like "1.3" or "7.439" to a floating-point number. Converts a string that represents a date and time value to the ASP.NET DateTime type. Converts any other data type to a string. An operator is a keyword or character that tells ASP.NET what kind of command to perform in an expression. Visual Basic supports many operators, but you only need to recognize a few to get started developing ASP.NET web pages. The following table summarizes the most common operators. Math operators used in numerical expressions. Assignment and equality. Depending on context, either assigns the value on the right side of a statement to the object on the left side, or checks the values for equality. Inequality. Returns True if the values are not equal. Less than, greater than, less than or equal, and greater than or equal. Concatenation, which is used to join strings.
' The displayed result is "abcdef". The increment and decrement operators, which add and subtract 1 (respectively) from a variable. Dot. Used to distinguish objects and their properties and methods. Parentheses. Used to group expressions, to pass parameters to methods, and to access members of arrays and collections. Not. Reverses a true value to false and vice versa. Typically used as a shorthand way to test for False (that is, for not True). Logical AND and OR, which are used to link conditions together. A URL begins with either a domain name (http://www.example.com) or a server name (http://localhost, http://mycomputer). A URL corresponds to a physical path on a host computer. 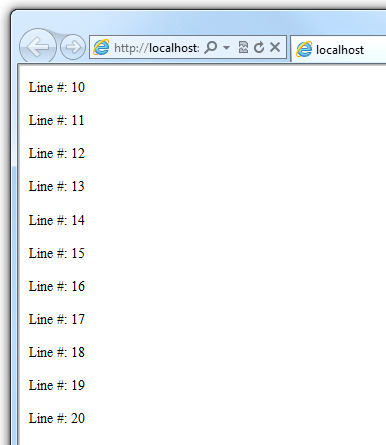 For example, http://myserver might correspond to the folder C:\websites\mywebsite on the server. A virtual path is shorthand to represent paths in code without having to specify the full path. It includes the portion of a URL that follows the domain or server name. When you use virtual paths, you can move your code to a different domain or server without having to update the paths. When you work with files and folders in code, sometimes you need to reference the physical path and sometimes a virtual path, depending on what objects you're working with. ASP.NET gives you these tools for working with file and folder paths in code: the Server.MapPath method, and the ~ operator and Href method. The Server.MapPath method converts a virtual path (like /default.cshtml) to an absolute physical path (like C:\WebSites\MyWebSiteFolder\default.cshtml). You use this method any time you need a complete physical path. A typical example is when you're reading or writing a text file or image file on the web server. In markup, you use the ~ operator to create paths to resources like image files, other web pages, and CSS files. When the page runs, ASP.NET looks through the page (both code and markup) and resolves all the ~ references to the appropriate path. ASP.NET server code lets you perform tasks based on conditions and write code that repeats statements a specific number of times that is, code that runs a loop). If an If statement starts a code block, you don't have to use the normal Code...End Code statements to include the blocks. You can just add @ to the block, and it will work. This approach works with If as well as other Visual Basic programming keywords that are followed by code blocks, including For, For Each, Do While, etc.
' or equal to $5, display this message.
' For balances greater than $5, display balance. In this example, if the first condition in the If block is not true, the ElseIf condition is checked. If that condition is met, the statements in the ElseIf block are executed. If none of the conditions are met, the statements in the Else block are executed. You can add any number of ElseIf blocks, and then close with an Else block as the "everything else" condition. greeting = "Ok, it's a marvelous Monday." greeting = "It's a tremendous Tuesday." greeting = "Wild Wednesday is here!" greeting = "It's some other day, oh well." The value to test is in parentheses (in the example, the weekday variable). 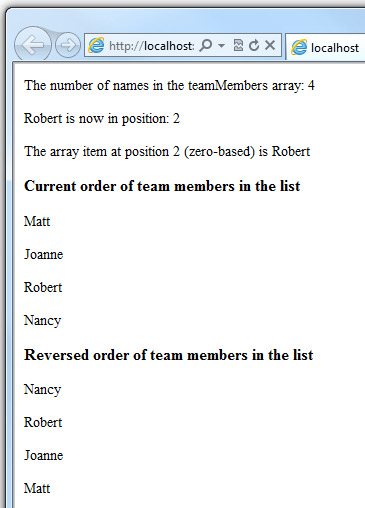 Each individual test uses a Case statement that lists a value. If the value of a Case statement matches the test value, the code in that Case block is executed. Immediately after the For statement, you declare a counter variable (you don't have to use Dim) and then indicate the range, as in i = 10 to 20. This means the variable i will start counting at 10 and continue until it reaches 20 (inclusive). Between the For and Next statements is the content of the block. This can contain one or more code statements that execute with each loop. The Next i statement ends the loop. It increments the counter and starts the next iteration of the loop. The line of code between the For and Next lines contains the code that runs for each iteration of the loop. The markup creates a new paragraph (<p> element) each time and adds a line to the output, displaying the value of i (the counter). When you run this page, the example creates 11 lines displaying the output, with the text in each line indicating the item number. If you're working with a collection or array, you often use a For Each loop. A collection is a group of similar objects, and the For Each loop lets you carry out a task on each item in the collection. This type of loop is convenient for collections, because unlike a For loop, you don't have to increment the counter or set a limit. Instead, the For Each loop code simply proceeds through the collection until it's finished. This example returns the items in the Request.ServerVariables collection (which contains information about your web server). It uses a For Each loop to display the name of each item by creating a new <li> element in an HTML bulleted list. The For Each keyword is followed by a variable that represents a single item in the collection (in the example, myItem), followed by the In keyword, followed by the collection you want to loop through. In the body of the For Each loop, you can access the current item using the variable that you declared earlier. 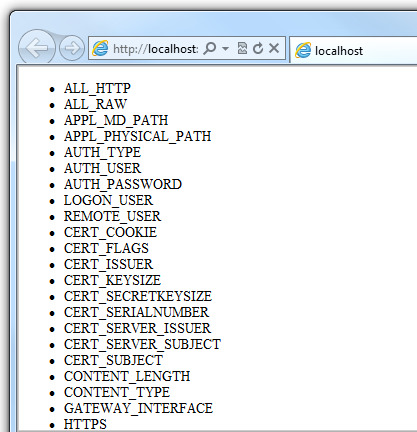 Nearly everything in an ASP.NET website is an object, including the web page itself. This section discusses some important objects you'll work with frequently in your code. Request. As you've already seen, this is a collection of information about the current request, including what type of browser made the request, the URL of the page, the user identity, etc. Response. This is a collection of information about the response (page) that will be sent to the browser when the server code has finished running. For example, you can use this property to write information into the response.
' Access the page's Request object to retrieve the URL. With arrays, you declare a specific data type, such as String, Integer, or DateTime. To indicate that the variable can contain an array, you add parentheses to the variable name in the declaration (such as Dim myVar() As String). You can access items in an array using their position (index) or by using the For Each statement. Array indexes are zero-based — that is, the first item is at position 0, the second item is at position 1, and so on. You can determine the number of items in an array by getting its Length property. To get the position of a specific item in the array (that is, to search the array), use the Array.IndexOf method. You can also do things like reverse the contents of an array (the Array.Reverse method) or sort the contents (the Array.Sort method). To create a dictionary, you use the New keyword to indicate that you're creating a new Dictionary object. You can assign a dictionary to a variable using the Dim keyword. You indicate the data types of the items in the dictionary using parentheses ( ( ) ). At the end of the declaration, you must add another pair of parentheses, because this is actually a method that creates a new dictionary. This method returns the physical path on the server that corresponds to a specified virtual path. The three parameters for the method are virtualPath, baseVirtualDir, and allowCrossAppMapping. (Notice that in the declaration, the parameters are listed with the data types of the data that they'll accept.) When you call this method, you must supply values for all three parameters. When you're using Visual Basic with the Razor syntax, you have two options for passing parameters to a method: positional parameters or named parameters. To call a method using positional parameters, you pass the parameters in a strict order that's specified in the method declaration. (You would typically know this order by reading documentation for the method.) You must follow the order, and you can't skip any of the parameters — if necessary, you pass an empty string ("") or null for a positional parameter that you don't have a value for. The following example assumes you have a folder named scripts on your website. The code calls the Request.MapPath method and passes values for the three parameters in the correct order. It then displays the resulting mapped path.
' Pass parameters to a method using positional parameters.
' Pass parameters to a method using named parameters. As you can see, the parameters are passed in a different order. However, if you run the previous example and this example, they'll return the same value. If your code tries to open, create, read, or write a file, all sorts of errors might occur. The file you want might not exist, it might be locked, the code might not have permissions, and so on. Similarly, if your code tries to update records in a database, there can be permissions issues, the connection to the database might be dropped, the data to save might be invalid, and so on. In programming terms, these situations are called exceptions. If your code encounters an exception, it generates (throws) an error message that is, at best, annoying to users. In situations where your code might encounter exceptions, and in order to avoid error messages of this type, you can use Try/Catch statements. In the Try statement, you run the code that you're checking. In one or more Catch statements, you can look for specific errors (specific types of exceptions) that might have occurred. You can include as many Catch statements as you need to look for errors that you're anticipating. We recommend that you avoid using the Response.Redirect method in Try/Catch statements, because it can cause an exception in your page. If your code didn't handle the exception, you would see an error page like the previous screen shot. 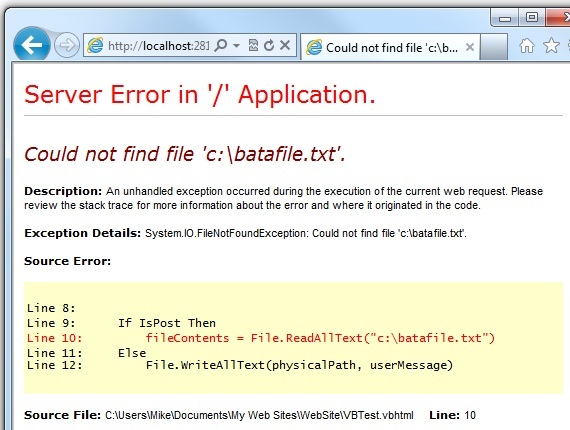 However, the Try/Catch section helps prevent the user from seeing these types of errors.
' the page, try to open the file.
' This code fails because of faulty path to the file.
' comment the above line of code and uncomment this one.
' You can use the exception object for debugging, logging, etc.
' Create a friendly error message for users.
' Similar to previous exception.
' The first time the page is requested, create the text file.